Here’s another great game for Red Hatters! 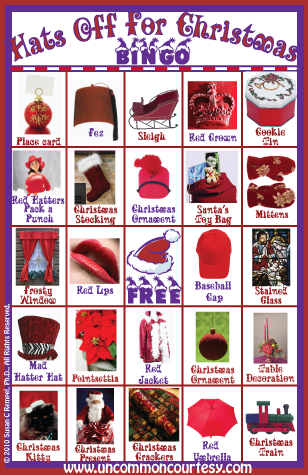 What a festive combination of a variety of red Christmas items, red hats, and an assortment of all things red. This game uses pictures rather than clipart. Take a look at the Mad Hatter Hat and the Christmas Crackers as good examples of the fun photos that I used to make up this Christmas game. What a great activity for a Red Hat Christmas tea, Red Hat Christmas luncheon, or have a Red Hat Bingo Night at Christmas time to raise money for charity! It’s a fun bingo game for any get together where the ladies in Red Hats and purple dresses (or of course pink hats and lavender dresses) are joining together in sisterhood that is focused on celebrating the good times in life!